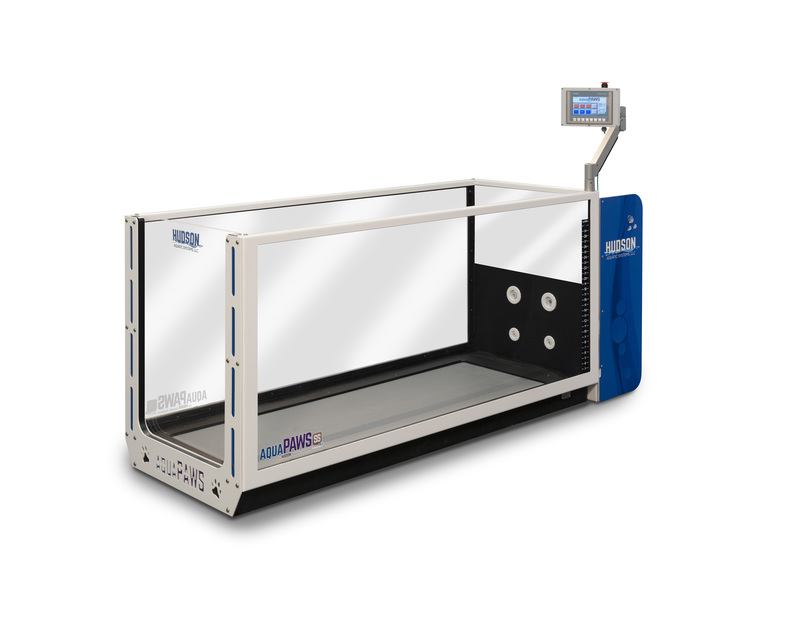 The AquaPaws SS underwater treadmill system is designed to improve the lives of canines and small animals by offering low-impact, high-resistance aquatic therapy or workouts for rehabilitation from injury, optimal training and conditioning, and weight loss. AquaPaws SS provides the natural properties of water (buoyancy, resistance and hydrostatic pressure) for a rigorous cardiovascular workout with reduced impact and stress on joints with enhanced features new to the AquaPaws product line. The latest unit in the AquaPaws underwater treadmill line, the AquaPaws SS offers a lower entry threshold, magnetic door, larger running surface, larger windows, and holds up to 30” of water to accommodate larger breeds. The treadmill also offers adjustable speeds for a more rigorous workout, along with several optional features like resistance jets, an incline adjustment, and therapy bench to enhance patient outcomes. It’s also a more user-friendly system, with a shorter frame for easier access, the touch screen control panel has an articulating arm that can be mounted on any corner, and no tools are required for maintenance and cleaning. There are even optional UV and Ozone sanitary systems available to help keep the water cleaner, longer. Contact Us for more information about how AquaPaws SS is the right fit for your practice. Payments as low as $600 per month. Adjustable speed range from 0.1-9MPH allows for a comfortable speed for the smallest injured dog to the top athlete. Speed is adjustable by 0.1 increments.